With the tape recorder playing this ballad sung by Micheal Jackson in the background in my room, an enthralling book in hand, I used to hear this song as a 12 year old ready to step into my teens. Then I heard it again at 17, full of dreams and looking forward to what life had to offer. The same song played in the background too when I went out for a drive with my then friend and now husband, my soul mate Ro! Fast forward to a couple of weeks ago. With a one year old baby in my arms sitting in the front seat next to Ro, we heard this track again on one of those long yet sweet drives. I was surprised that this song stirred the same emotions in me now as it did when I was a 12 year old. After all these are what classics are made of and only great artists like Michael Jackson can create timeless pieces of music this way, music that doesnt wither away with transient time! This Cheese and Spinach Pie is also a true classic in its own right. It can be had in any season and dare I say at any time of the day! I made it in one of the Emile Henry Pie plates that Ro picked up for me from Williams Sonoma, as part of an elaborate menu for a candle lit dinner at home, replete with a well laid table just the way he likes it and fresh flowers, just the way I like it, on his birthday. 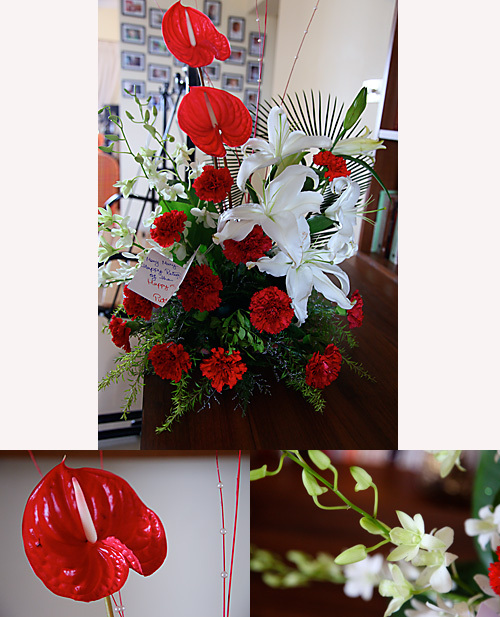 Just a small gesture from me to make my man feel special on his day. When he savoured every bite of the pie, it was a satiating experience for me. Few things in life, in my humble opinion that is, can be better than a slice of home made pie. And there is nothing not to love in this pie. 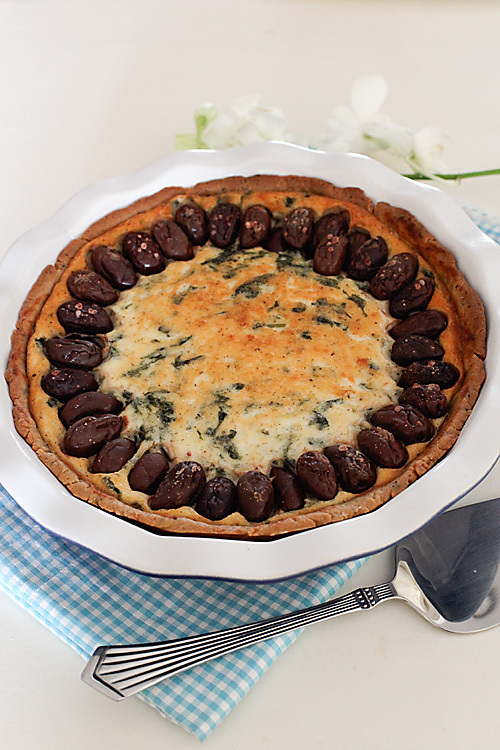 Made with few ingredients, an Olive Oil crust, sans butter but rich in flavour, a filling with Cheese, Spinach, Herbs and Olives. And you could use a variety of cheese here. Think Ricotta, Cottage Cheese or Goat Cheese or even good old Panir, freshly made Indian cheese without compromising on the flavour or taste of the dish. You could use any cheese here like ricotta, cottage cheese, panir cheese or goat cheese. 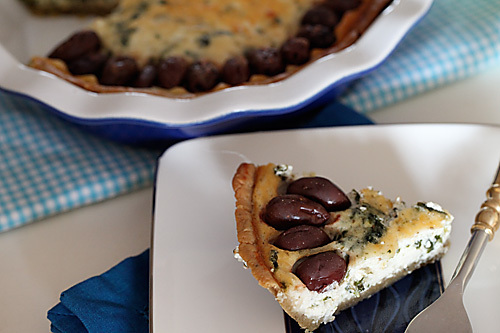 Kalamata olives can be substituted with any other olive. 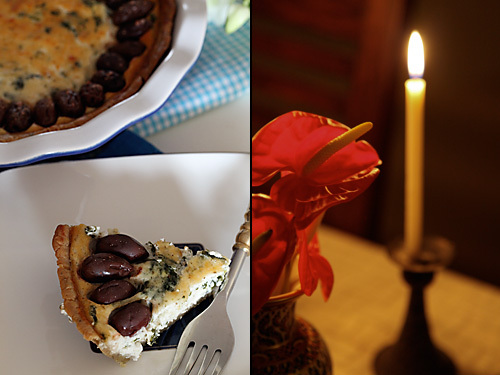 Lightly grease a tart pan or a pie dish with olive oil. In a large bowl mix the flour, salt and herbs. Pour in the oil and mix until you get coarse crumbs. Add in the water, then knead lightly with your hand until the dough comes together into a ball. 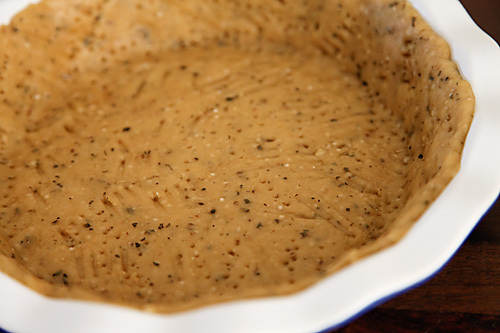 On a lightly floured surface roll the dough into a circle big enough to fit into your pie mould or tart pan. Remember to keep the surface dry by sprinkling a little flour on the rolling pin and smear a little over the pie dough too, Keep rotating the dough each time you roll it and add a little flour above and beneath the dough when it is on the verge of sticking to the surface. This will ensure a nice round circle. Carefully transfer the dough into the prepared pan, trimming the edges if necessary. Place the pan in the refrigerator for 30 minutes to rest. Prick with a fork all over and blind bake the crust at 200°C (400°F) for 10 minutes. Allow to cool completely. In a blender or food processor combine the filling ingredients, the cheese, cream, cornflour, salt and herbs and process until smooth and creamy. Mix in the thoroughly drained and chopped spinach. Sprinkle some rolled oats over the pie crust. This will help to absorb moisture from the filling. Spoon the pie filling over the pie crust. 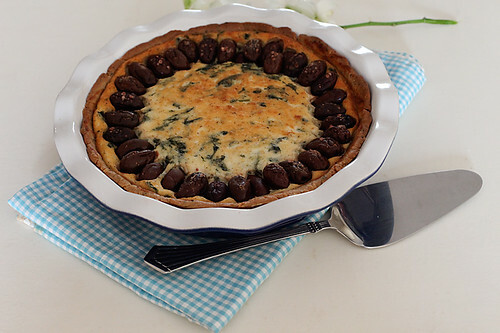 Decoratively arrange the Olives over the pie and bake for 20 to 30 minutes until just set or lightly browned at the top. Pie crust recipe adapted from here. *If using ricotta or cottage cheese, make sure you completely drain the water off, by leaving it over a strainer with a pot below to collect the liquid in the refrigerator. Serves 6 to 8 depending on the portion sizes. Lovely pie and you write really well 🙂 Cool pics as well. Awesome post again. That's a very good looking pie! This is one of the most gorgeous looking pies I have seen – and the fact that it does not have the proverbial ONE CUP BUTTER makes it all the more beautiful to me! I'm going to try this very soon – no birthday or anniversary in sight but can make an occasion around this! I'm kicking myself for not landing up on your superb blog earlier- bookmarked promptly. That spinach and cheese pie looks so good! The pie looks so good! I need to get some kalamata olives. Nitya: Try draining all the water from the cottage cheese by straining it for a couple of hours or more. There's no reason it should not work then! Hey Anu, tried cheese and spinach pie….turned out real yumm. Not as good and perfect like ur but still ok.
Lovely blog. What is the consistency of the filling, spoonable is it? Just tried this recipe, 500 gm paneer when mixed with 200 ml cream gave me a very thick mixture , it was quite difficult to blend it as it was thick. So I added little milk to make it creamy which resulted in a bit of a mushy texture when cut after being baked. The taste was good and I could cut it into pieces too but not as firm.. Also do we have to wait for the pie to cool down before cutting it to get firm pieces?i happened to cut it when it was very hot. Radhika: If your paneer was hard, then make sure you put the paneer in warm water to soften it. Soft paneer with 200 ml cream will give you a creamy mixture. Allow it to cool a little before cutting it into pieces. What else can i use other than spinach? Dilekha- You can use any other greens or vegetables like broccoli and pumpkin. Made it with broccol, your foccacia, chocolate pudding. everyone loved it. your knowledge and generosity is a gift. Not a lot of people share their recipes. Thank you. Dilekha. Thanks so much for your wishes.